Morgan Leppelmeier bumps one in a league match this season. She was named BBC Player of the Year. 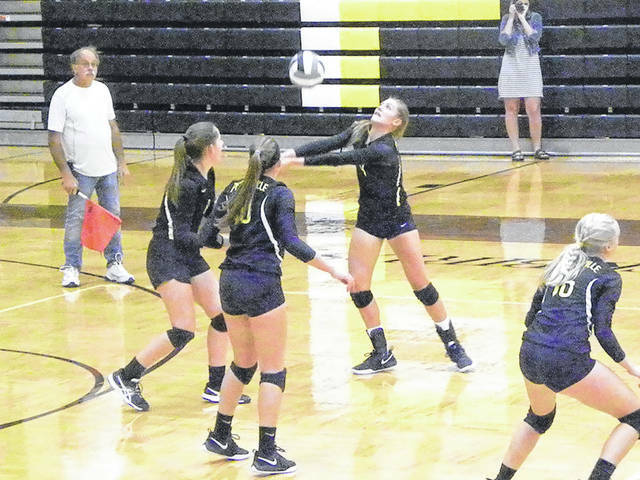 The Buckeye Border Conference recently announced their all-league volleyball teams. The player of the year in the league was Morgan Leppelmeier of Pettisville. Also first team All-BBC for the Blackbirds was Mauricea Crouch. Danielle King, Megan King, Mikayla Graber and Ryeana Klopfenstein were each honorable mention. Second team all-league for Fayette was Trista Fruchey. Mataya Rufenacht was honorable mention for the Eagles. Kendall Roth, jr., Hilltop; Jaelyn Lyons, sr., Montpelier; Sidney McKarns, sr., North Central; Mauricea Crouch, sr., Pettisville; Brittney Haines, sr., Stryker; Riley Bloir, jr., Edon. Morgan Norden, jr., Hilltop; Addie Elser, sr., North Central; Emma Grime, sr., Stryker; Courtney Stewart, jr., Stryker; Claire Radabaugh, jr., Edon; Trista Fruchey, soph., Fayette. Pettisville: Danielle King, Megan King, Mikayla Graber, Ryeana Klopfenstein.